12.5" RCOS @ ~ f/9 (2880 mm fl) at 0.64 arcsec/pixel. Shown at 1.23 and 2.96 arcsec/pixel. SBIG STL-11000 w/ FW8 filter wheel, AstroDon Gen-2 filters. CCDSoft, CCDStack, PixInsight, Photoshop CS6. No SDSS stars were available for color balancing, so a standard image-train color calibration was used, as determined by eXcalibrator v4.25, and then adjusted for altitude extinction. CCDStack to calibrate all sub exposures and create the RGB image. PixInsight to register, normalize, data reject, combine the luminance sub exposures, gradient removal, non-linear stretching with HistogramTransformation, detail enhancement with HDRMultiscaleTransform and to create the LRGB image. PhotoShop for the final touch-up. North is to the left, the image is rotated 90° counter-clockwise. NGC 2170 is a reflection nebula in the constellation Monoceros at a distance of about 2,400 light-years. William Herschel discovered it on October 16, 1784. NGC 2170 is the orange cloud, which is illuminated by reflecting the light of nearby stars. 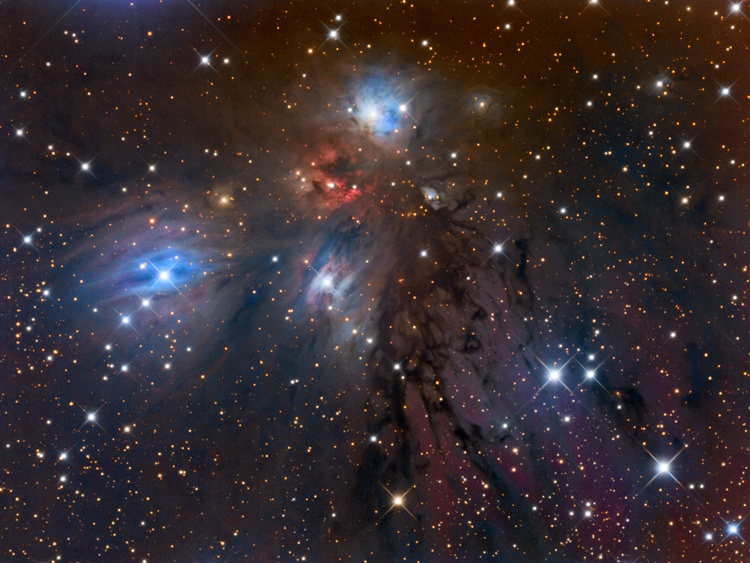 Three beautiful blue reflection nebulae accompany NGC 2170. The region also contains a few very small emission nebulae. Additionally many dark absorption nebulae form beautiful darker magenta structures.